So from the last post I had my design finalized, all I had to do was create some simple orthographics so I could get going on the model. 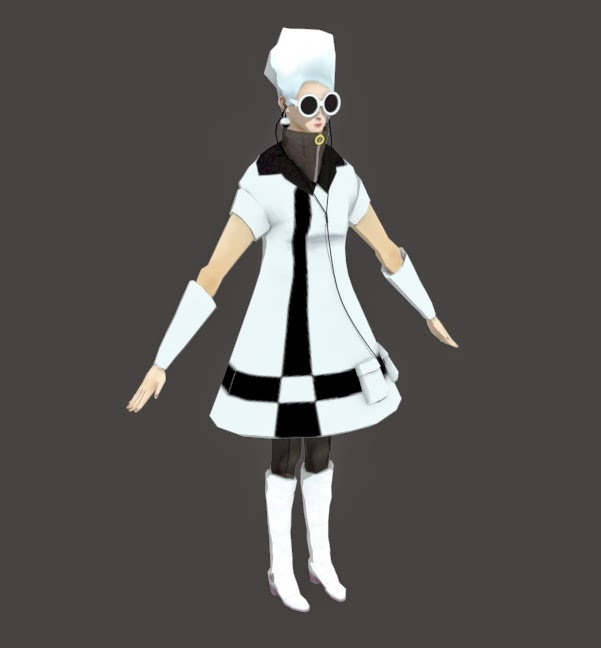 I only wanted to model one of the characters with my stretch goal being able to rig aswell so I decided to go with the woman as she appeared to be the stronger of the two designs. 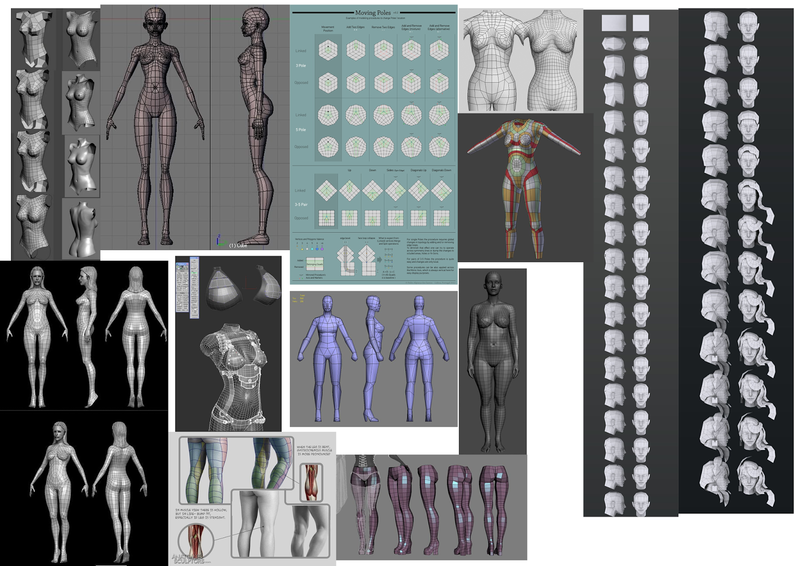 Topology and modelling reference board - Printing this out along with my other moodboards and concepts aswell allowed me to see everything without flicking between windows on the screen. I found this also helps in making sure my model still looks like my concepts aswell as seeing all the concept art in front of me helps me keep focused on the design. The head was quite interesting to model as I used the on the far right of the board as the base for the topology, this method required box modelling which was good but it meant I had to be careful in terms of how I rounded out the forms otherwise the woman would've had a very jaggy looking forehead. Box modelling makes it easier to define the forms of the face but for making sure the edge flow is correct strip modelling might be better suited. Texturing was quite a hard thing to balance as on the concept there wasn't a lot of details on things like the clothes folds because adding too much detail would detract from the original style of the concept which is more minimal, some amount of detail had to be applied so the character had some textural interest though and the hard part was striking a suitable balance between the two. In the labs one day I was just randomly looking through the programs we had on the lab computers just to see what we had and I came across 3Dcoat, which allowed me to paint texture straight onto my model using the base texture I already created, this allowed me to quickly iterate on the design without constantly resaving and checking 3ds max to see what my texture alterations look like. This was helpful aswell in fixing those horrible texture seams I got as I could just paint straight over them with hardly any fuss. Lit and Unlit versions of the final model - Which do you prefer? I was initially worried about this project as characters aren't my strong point but when I got my Pirate Radio concept down everything became a bit clearer. The first review of my project went well but it was only after when I received much better critique on my designs and then went back to focus back on the original 'cool/thinks they are cool' dichotomy that I came up with a design I was happier with. This however lead to less time creating the model and by extension not completing my stretch goals I set on this project which was to rig the model and pose it in a manner suitable for presentation. I will have to react to critique quicker from now on and be extra careful to stay to the original idea more so I don't end up in a stupid cycle of redesigning the same thing over and over, more brainstorming and experimentation in the early stages of future projects could be a good place to start. As with the Sentry Turret, an important thing for me to focus on is the actual modelling stage which takes me forever. A bit more speed modelling practice and 3d studies will benefit me here as this seems to be my weakest area at the moment despite having a bit more 3d background before I joined this course. My next project involves me speed modelling a Westland Wyvern fighter plane which should be the perfect thing to help me push my modelling skills. +Texturing I thought turned out well and matched the look of the concept, also using 3D coat to paint out those seams is another new thing for me and will work on this method of texturing more.